Samsung hopes to get the jump on Apple. But will it be enough? On Thursday, Samsung will host its second Unpacked event of the year to introduce its newest phablets, the jumbo-sized hybrids between smartphones and tablets. The company is expected to release the Galaxy Note 5, which will include a metal back instead of plastic and an improved stylus, as well as the Galaxy S6 Edge Plus, which is believed to have a 5.7-inch screen that curves over the sides of the device. Samsung has traditionally unveiled its latest marquee phablet smartphone at the Berlin-based IFA electronics trade show in early September. But this time around, it moved the date up by a couple of weeks and shifted its event to New York in what some believe is an attempt to get an even earlier jump on Apple’s next iPhone introduction — which likely will take place in early September. The move speaks to the root of Samsung’s troubles: It’s no longer the only game in town when it comes to big-screen smartphones, and it now faces stiff competition in a market that has never sold in huge volumes. Consumers aren’t willing to pay the premium prices Samsung’s asking when there are many similar, cheaper Android devices available. Add to that the general malaise in the smartphone market, and Samsung has a problem. The company didn’t respond to a request for comment. For the first time, Samsung’s Note line is launching with a bigger-screen iPhone — the 5.5-inch 6 Plus — already on the market and its follow-up — likely called the iPhone 6S Plus — coming soon. Last year’s Galaxy Note 4 had a short run as the sole high-profile phablet smartphone, even if the iPhone 6 Plus was one of the worst-kept secrets in technology. But a two-week lead — or even a month, depending on when the devices go on sale — likely won’t be enough to turn things around for Samsung. Apple is reportedly set to hold its own iPhone event on September 9. The South Korean company has reported seven straight quarters of declining profits, and it’s cutting prices on its 3-month-old Galaxy S6 and Galaxy S6 Edge devices to boost sales. Its smartphone market share has tumbled over the past year — from controlling about a third of the sector with the Galaxy S3 and S4 in 2012 and 2013, to sharing the title of No. 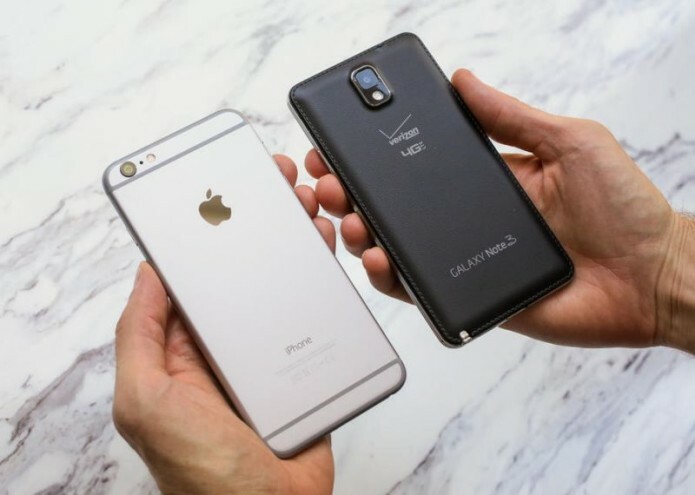 1 smartphone vendor with Apple in the fourth quarter of 2014. Both companies controlled about a fifth of the market in that period, the first full quarter of iPhone 6 and 6 Plus sales, according to Gartner. Samsung created the phablet market with its 5.3-inch Galaxy Note in 2011. Though the device initially was mocked for its large, almost comical display, the bigger screen size gradually attracted consumers. Carriers liked it because the Note tended to attract more affluent power users who preferred to spend their time staring at a larger screen. By the time Samsung released the Note 3 in 2013, phablets had plenty of fans, including among other device makers who released their own big-screen phones. With that in mind, Samsung last year unveiled two phablets, the Note 4 and its first smartphone with a display that curved around the side, the Galaxy Note Edge. But Apple’s new iPhone 6 and 6 Plus took away the one big advantage Samsung had — bigger screens. For Apple, that has turned out to be a goldmine. In the June quarter, it sold 47.5 million iPhones, up 35 percent from the previous year. Apple’s entry into the phablet business helped shine a spotlight on the category. In the US, 13 percent of smartphone sales in the second quarter were devices with 5.5-inch screens or larger, up from 5.5 percent in the same period in 2014, according to Kantar Worldpanel, with Apple quickly taking the lead in a market Samsung once dominated. Samsung surely hopes the significant changes it’s making in its Note line — including the hardware redesign that give its phones a more premium feel — will be enough to attract buyers, especially in a year Apple likely only tweaks its iPhones. The Cupertino, California, company tends to do major redesigns every other year, opting instead for more subtle changes in the off “S” year. But until consumers get excited about smartphones again — if they ever do — Samsung will likely continue to struggle, no matter how flashy its new phablets look. “The competitive forces are brutal right now,” said Current Analysis analyst Avi Greengart.